Despite a shifting regional population due to the high cost of living, strong fundamentals and above average rent growth will keep San Diego as a viable city for multifamily owners says CoStar’s Joshua Ohl. Speaking During the CoStar Group’s San Diego Apartment Overview event, Mr. Ohl, a Senior Marketing Analyst, suggested that San Diego continues to trend into a renter-focused metro as housing prices continue to skyrocket. 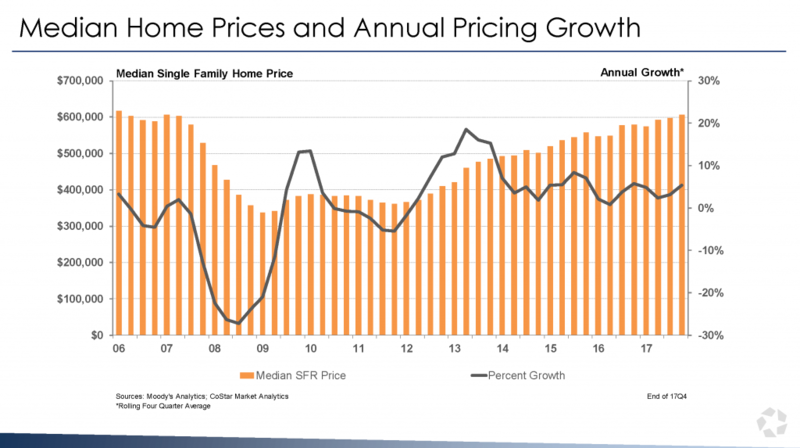 Ohl’s data suggests that the median price for a single-family residence (SFR) in San Diego county has reached over $600,000 a 3% increase from the previous year. Although this change has happened gradually since mid-2011, CoStar also reported that despite superb regional unemployment (under 4%) the median renter household income of $48,500 per year keeps the possibility of homeownership out of reach. Ohl maintains that this, coupled with a lack of single family inventory, has resulted in a housing scenario that may be ideal for rental owners. 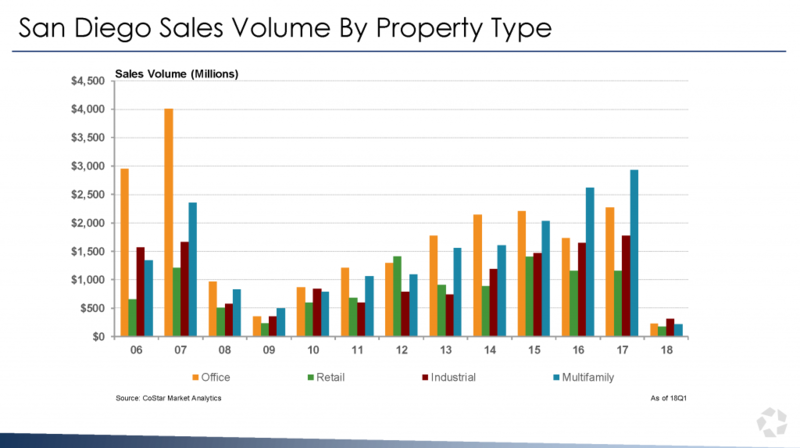 Occupancy Rates and Rent Growth will continue to climb until new inventory is absorbed into the market. CoStar data suggests that new inventory will inevitably come online, particularly in the early part of 2019. Until this absorption occurs however, San Diego is forecasted to see a solid bump in rental rates by late 2018. Analyzing over 49,074 entries of up-to-date property data across San Diego County, Ohl noted that regional rent growth continues to trend upward with a current year-over-year average of 3.7%, and an average per unit rent of $1,740. 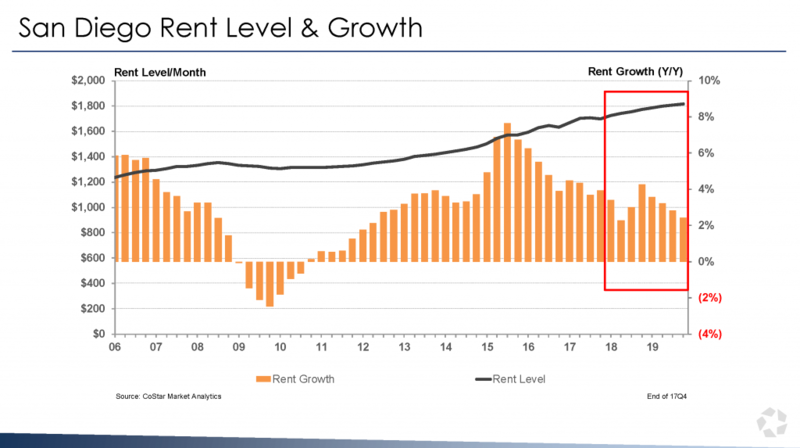 The data emphasized significant optimism for rental growth going into the latter half of 2018. projections suggest rent growth could reach as high as 4.1-4.2% by Q4 2018 before dropping off due to absorption of the 2019 inventory. CoStar Group also took time to emphasize how a positive regional outlook has been an indicator of successful sales in recent years. Ohl noted that strong showing in rent growth and strong regional fundamentals like a prolonged economic expansion have helped push real estate transaction volume to new heights. 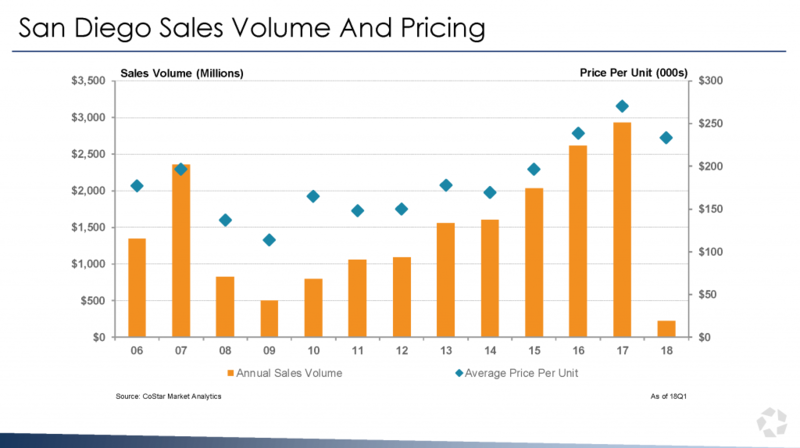 Lead over the last few years by strong multifamily sales, San Diego saw year-over-year multifamily transaction volume increase by 10%. This is notable because at the same time at the national scale, similar product has seen a 9% slowdown. Using data through Q1 2018, CoStar found that 2017 marked the highest average sales value on record since 2006 with an average price per unit exceeding $270. 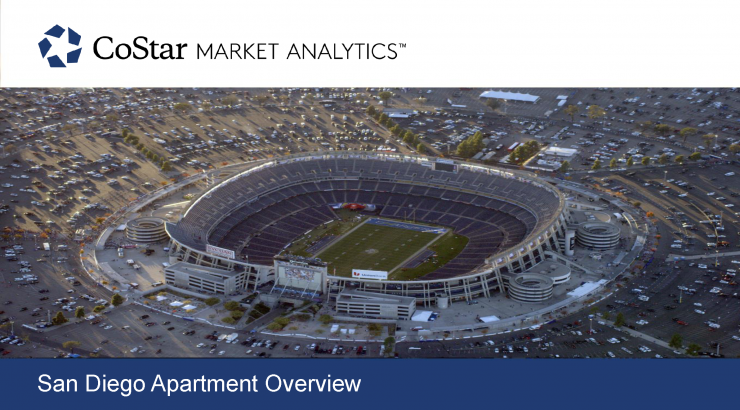 The data presented during the CoStar Group’s San Diego Apartment Overview highlight the full effects that a lack of new housing supply has had on the rental market. The continued upward mobility of single family home prices coupled with a lack of multifamily supply should embolden investors about the value of their asset that will continue into 2019. If property owners invest wisely, there is a high chance that their product will continue to outperform the national average.